The state on Tuesday gave preliminary approval to Hilcorp Alaska's environmental monitoring plan for its natural gas leak in Cook Inlet, an effort required by state regulators to better understand potential threats to the environment and to wildlife in particular. Ongoing searches from aircraft have found no birds or marine mammals, including endangered beluga whales, that were injured in the "bubble field" of leaking gas, state officials have said. But Hilcorp's daily overflights have come up against sea ice, which in recent weeks has prevented observers from spotting roiling water associated with the leak. Silty water in the Inlet also reduces visibility. Equipment needed by Hilcorp to conduct air and water sampling — some made by companies outside of Alaska — was apparently not available for deployment as of Tuesday afternoon. "Hilcorp will commence sampling and monitoring when the sampling platforms and sensors arrive and as weather permits," the Alaska Department of Environmental Conservation said in an incident report issued on Tuesday. Hilcorp on Wednesday did not respond to requests for comment. DEC gave initial approval to the monitoring and sampling plan in part because it wanted to hasten the review of potential environmental impacts associated with the leak. A letter from DEC Central region manager Geoff Merrell to Hilcorp on Tuesday said the preliminary approval was meant to reduce the time it would take to get, mobilize and outfit equipment. "We're basically reserving the right to propose a different process, but at this point, time is of the essence," said Candice Bressler, DEC public information officer. Hilcorp said in a statement to reporters on Tuesday that it has reduced the leak rate, an ongoing effort achieved by trimming work on the four offshore platforms that rely on the gas shipped for fuel in the leaking pipeline. The midrange leak rate is now estimated to be about 200,000 cubic feet of gas a day, the DEC reported. That's down from 275,000 cubic feet of gas daily in mid-February, shortly after the leak's discovery on Feb. 7. Hilcorp said it believes the leak began in December. The new, lower amount of leakage would have provided natural gas for about 290 homes in Southcentral Alaska in the cold month of December, based on average household consumption rates made public by utility Enstar Natural Gas Co.
Hilcorp has indicated it does not expect to begin repairing the leak until at least late this month, in part because ice pans covering the leak present dangers for divers in the Inlet's strong tides. The Pipeline and Hazardous Materials Safety Administration has said it wants the leak fixed by May 1, or the line shut down. The leaking 8-inch pipeline is about 80 feet underwater and about 3½ miles off the coast northwest of Nikiski. 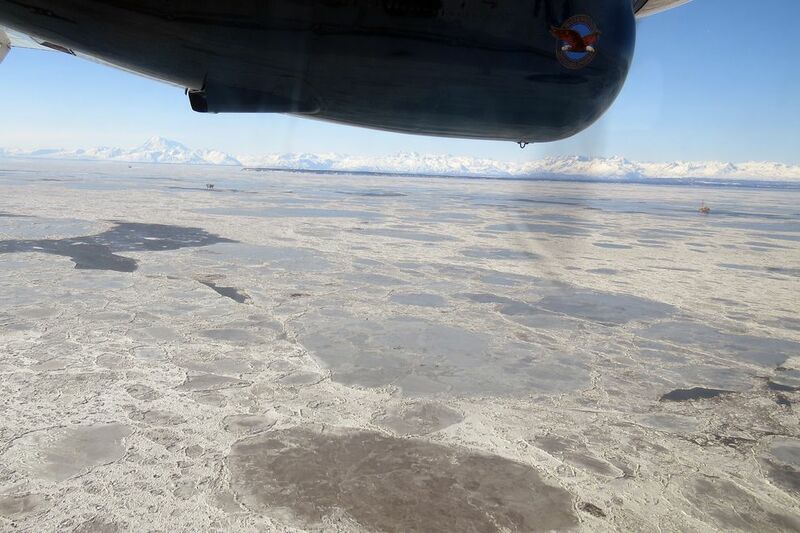 On March 9, a Hilcorp surveillance flight reviewed Cook Inlet shorelines from Anchorage to southern Kalgin Island, with five state officials aboard, three from the DEC and two from Alaska Fish and Game. "Hundreds of birds were observed on the western side of the Inlet, but none were detected near the bubble field," the DEC said. A second wildlife reconnaissance flight was also conducted, with a protected species observer from Cook Inlet Spill Prevention and Response, a spill cleanup contractor, and a wildlife professional from International Bird Rescue, the DEC said. "No beluga whales or marine mammals were observed during either flight, and birds were not observed" in a 20-square-mile area around the leak, the DEC said. Wildlife monitoring conducted in the area of the leak has consistently shown no evidence of animals, said Merrell, with the DEC.
Jeanette Alas, a habitat biologist with Alaska Fish and Game, said visibility is limited by water quality and ice. Ice covered about 95 percent of the water in an area around the leak on March 9, according to another Fish and Game employee who went on that flight, Alas said. Hilcorp's proposed plan should show to what extent, if any, methane is displacing oxygen in the water above the leak, she said. It could also give more information about how fish and other animals might be affected, if at all. Fish and Game officials looking for injured wildlife have gone on two flights organized by Hilcorp in recent weeks and plan to go on more, she said. "There have not been any observed impacts," Alas said. Under its proposed plan, Hilcorp intends to conduct twice weekly helicopter overflights with trained wildlife observers, weather permitting, across a 20-square mile area around the leak. Barbara Callahan, head of International Bird Rescue's office in Alaska, said the concentrated sea ice in the large area around the leak is a silver lining for the Inlet's sea ducks, which overwinter in the region. Sea ducks such as scoters use sections of open water, in part to breathe at the surface after feeding on sea-bottom clams and mussels, she said. An International Bird Rescue official who flew on March 9 over the 20-square-mile area around the leak reported open water was at least a mile away, Callahan said. If Hilcorp can fix the leak as soon as the ice recedes, sea ducks should be safe, she said. "We're pretty lucky we're not in the middle of a migration now," such as the auklets or murres that are expected to arrive starting in a month, she said. If ice and other conditions cooperate, Hilcorp plans to deploy drifting buoys with sensors starting March 24 to collect information about water and air quality around the leak. It also plans to collect acoustic information because the leak is forming "bubbles that generate underwater noise," creating sounds that could disturb marine mammals, affecting their search for prey, Hilcorp's plan says. The acoustic recorder will be suspended from a float tied to a vessel. The buoys are meant to withstand the ice but could be destroyed by the ice in "rapidly changing conditions," Hilcorp's plan says. That could cause at least a three-week delay as new sensors are acquired and new buoy systems are built, Hilcorp said. The equipment won't be deployed unless ice conditions are safe enough to do so, Hilcorp's plan said. The company has proposed using the 190-foot Resolution, owned by Ocean Marine Services Inc., for the monitoring and sampling work. "To date, no significant impacts to wildlife or the environment have been observed and the release does not pose a threat to the general public," Hilcorp's statement said. Hilcorp also said a consultant has modeled the amount of methane dissolving in the water column. The estimate showed that concentrations "would likely be approximately 1/500th of the concentration level that may be harmful to fish," based on a standard provided by the DEC.
Hilcorp said Tuesday it "will begin implementing the monitoring program in several stages as conditions allow using marine vessels, buoys and other equipment."